Edit 16/12/2014: I’m afraid I’ve heard nothing good about Shu Castle for the last 6 months and so I can no longer recommend it. Edit 29/08/2015: Apparently the menu has been re-vamped (see comment below) but I haven’t been back to try it yet. I’ve said it before and I’ll say it again: as much as I love South East London with all my heart, there are two areas that really test the limits of my affection and they are Elephant and the Old Kent Road. There’s just not much going for them, aesthetically or gastronomically speaking. When I worked in the city my bus would chug down the OKR every single day and I studied every inch of its bleak length looking for anything that might be remotely worth the effort of checking out. For some reason I had dismissed Shu Castle straight away; I mean, a Chinese place on the Old Kent Road, no-one’s exactly going to rush to try it, are they? Century eggs with green chilli pepper. 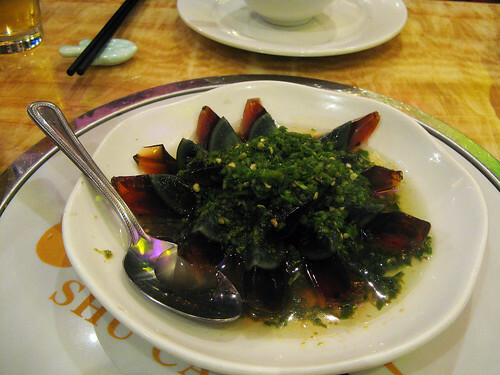 My first century egg – unbelievable, I know. They arrived, pungent and alarming in colour; the yolks tinged green and the whites, orange/purple. Their preservation for several weeks or months renders them scary in appearance and odour but I was pleased to find, relatively subtle in flavour; just like an egg, but richer, creamier. Addictive. 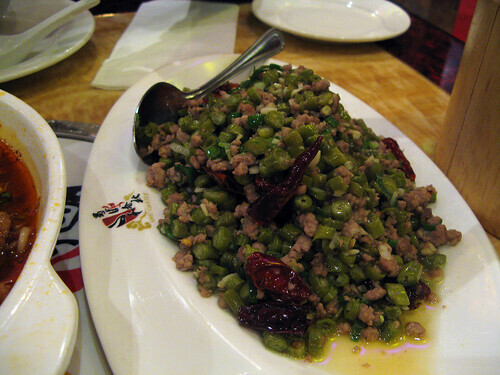 This dish was hot, because there was a massive great pile of chopped green chillies on top. Duh. 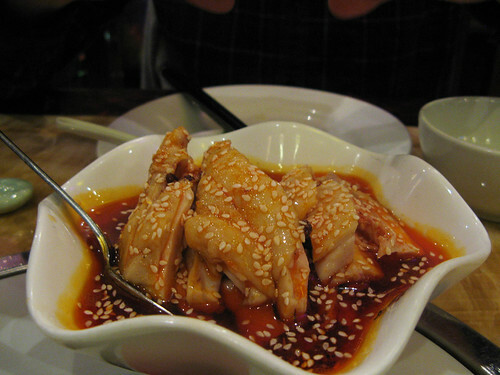 Cold chicken arrived sliced in chilli oil, scattered with sesame seeds; slippery and tender. Cold poached chicken fat should be horrible but somehow is pleasingly silken; the Chinese love those jellified textures and so do I.
Pickled beans with pork mince. Pickles and pork, in the same dish? It was always going to get ordered. Little bullets of preserved beans, slightly musty, slightly bitter seemed to enhance the sweetness of the pork; it’s the kind of dish I’m going to spend silly amounts of time thinking about over the next few weeks. We kept it simple with the meaty main: beef in chilli oil. This is what I want when I go for a Sichuan meal, bits of stuff bobbing about in a bloody great vat of spicy oil. “It’s hot” said the waitress “we know, that’s why we came here” said my mate. Tender slippery strips of meat plus bamboo shoots and Chinese leaves were fished from the scarlet depths. I particularly enjoyed the freshness of the coriander on top; something you don’t often see in Sichuan restaurants. 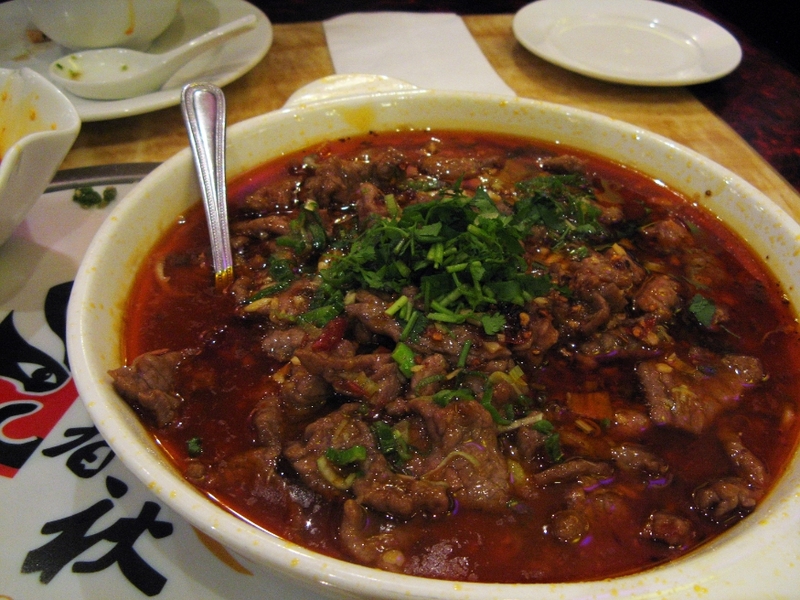 I would have a liked a little more numbing from Sichuan peppercorns, but still, a great dish. 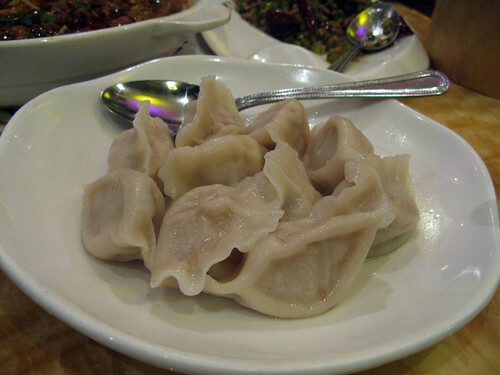 There were also boiled porky dumplings with chilli oil, soft and exactly as expected; a simple dumpling fix. There was a broth of gourd and again, pork, which was delicate, tasting subtly of simmered pork fat (in a good way, promise). Strangely moreish. A reason to visit the Old Kent Road; who’d have thunk it?! The restaurant is tucked into the side of a hotel; the toilets are um…well, it’s not The Ritz is it, it’s a restaurant on the Old Kent Road. The carpet speaks of more than a few major spillages (chilli oil is a right bugger to get out, trust me, I speak from experience); the food however, is very good indeed. I’d like to feel a few more Sichuan peppercorns anaesthetising my mouth but apart from that, no grumbles. The portions are huge and we spent £76 between 3 with 3 beers each. 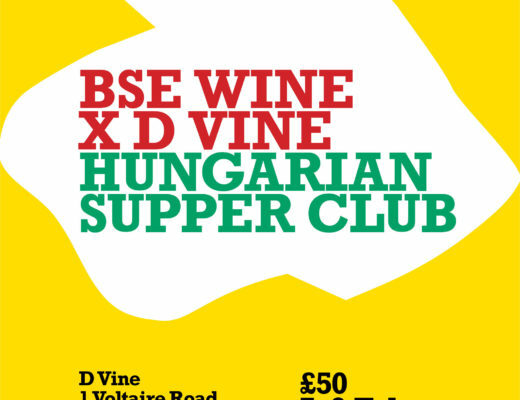 South East London, with Wuli Wuli and Shu Castle, you really are spoiling us. There really is a reason the Old Kent Road was so cheap on the Monopoly board…but you’ve actually made me want to faff about getting from Brixton to try the pickled beans with pork mince immediately. Costa Azul next to Shu Castle is also great. They do amazing Ecuadorian style fish stews/soups and pork and beans etc. haha tell me about it, i LIVE at the elephant and castle area, and often go down okr to get to tescos/asda, and everything always looks so bleak. thanks for the review though, I will keep that in mind for when I want a taste of home without venturing to chinatown. Also, I’m sure you’ve checked it out already, but if you want cheap yet excellent regional chinese food you can’t go wrong with the Big Plate Chicken and homestyle cabbage down at Silk Road in Camberwell. Helen – you’re posts normally make my mouth water, and I do love Sichuan, but that egg… looks… well, let’s just say I feel a bit ill now! Ah, I’ve seen two positive posts about this place now, and am dying to go. I have gone past it so many times on the bus and dismissed it because it’s attached to that Eurotraveller hotel next door. Well, more fool me. Will try and get down there next week. 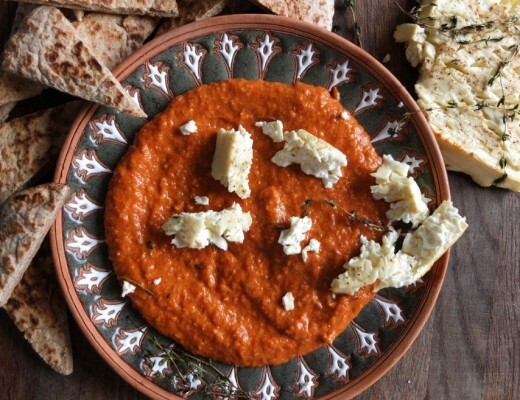 Have you ever tried Gourmet San in Bethnal Green? Really tasty Sichuan place that I used to go to quite a bit, but which is unfortuntely not much of an option since I streered towards vegetarianism – lots of ‘pork as a garnish’! Thanks for this review. I shall try it. Let’s hope Jay Rayner doesn’t spoil it anytime soon. Old Kent Rd and Elephant – dumps indeed. Also add Loughborough Junction and big chunks of New Cross to your shithole map. I don’t know about anyone else but I’ve always found Bar Shu – the Chinatown Szechuan where she is the “culinary advisor”, slightly disappointing. A bit like an english persons view of what a Szechuan restaurant should be like. Is this place more authentic ? 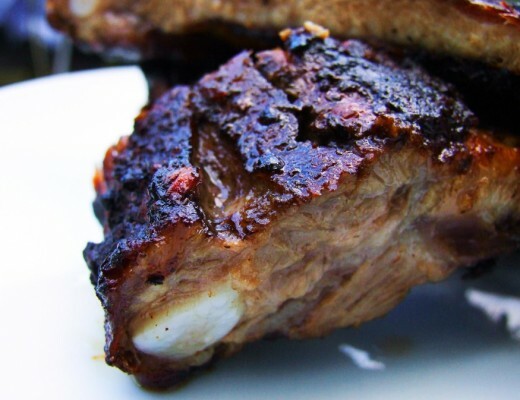 PS – Before you use up all your hickory chips could you let us have your take on slow smoked pork ribs, that seem to be all the rage this year…. Hello Sir Arthur, I am a big fan of FD too; love her books. Went through a bit of a phase as you can see somewhere in the archives. Yes this place is more authentic, lots and lots of heat. I would have liked a bit more numbing from peppercorns but still, very good. I’ll definitely go back. As for the ribs, I’ve been getting a bit of stick that this blog is PORK CENTRAL at the moment but I think the fact you’ve requested them means I absolutely have to make them now…so thanks! I will keep this review in mind. Your review made me see the place from a different perspective, a foodie’s perspective that is. Hi Helen: Shu Castle has been through a menu revamp in the last few months. Lots of crowd pleasing Chinese classic but turn to the back for pages of some great Sichuanese stuff – the new chef does some really great stuff with aubergines, believe me! Thanks for this Luke! I shall be down there ASAP to check it out.